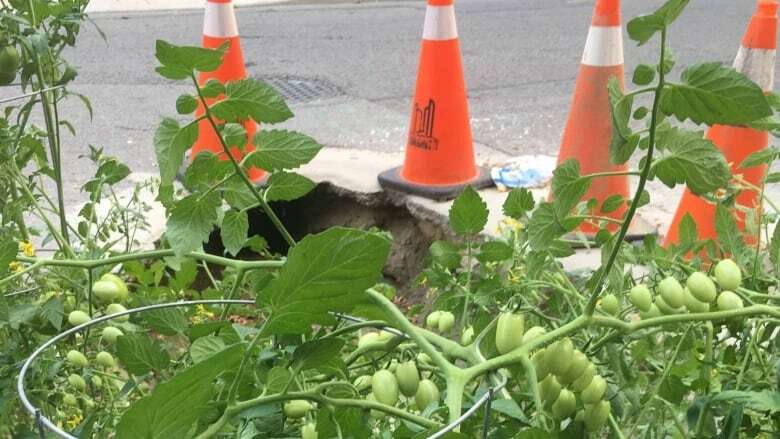 Toronto resident Bryan Link says he hopes the city doesn't rush to fix the massive pothole on his street — at least not until the tomatoes growing in it are ripe. 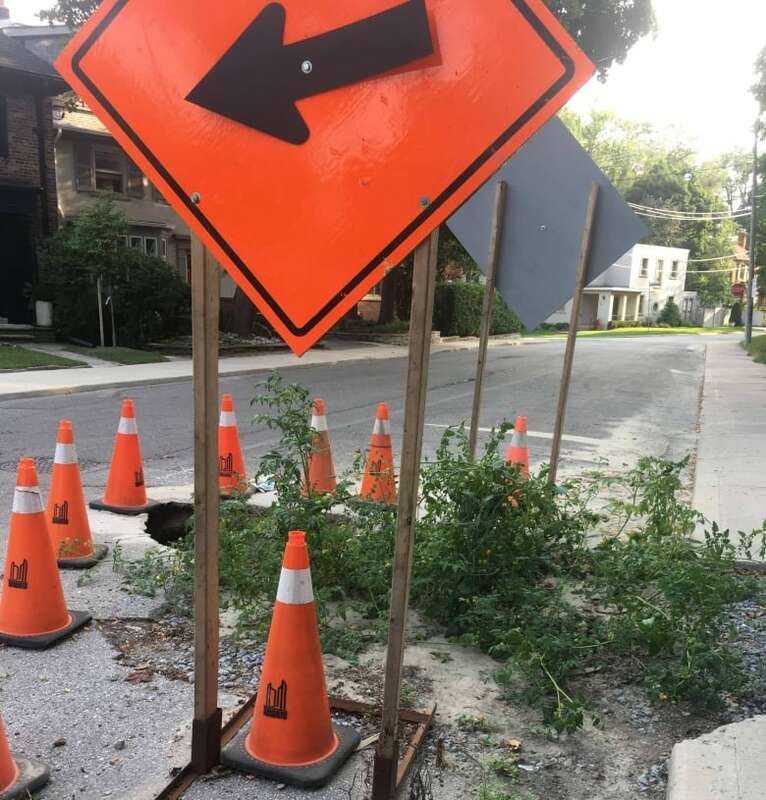 Bryan Link was walking his dog down his street when he first noticed something growing inside the big, ugly sinkhole that had been a blight on his Toronto neighbourhood for months. "Had to do a bit of a double-take because what I thought were probably weeds turned out to be tomatoes," Link, who lives near Rathnelly Ave. and Poplar Plains Crescent, told As It Happens guest host Matt Galloway. The plants, which Link says were planted earlier this summer by "somebody with a good sense of humour," have since blossomed into big, juicy green fruit. He said it's a big improvement over the gaping hole that was several feet deep — the result of nearby construction. "They're doing extremely well," Link said. "I think it's the perfect spot." As the plants have grown, Link says the neighbours have starting tending to them. Someone even erected stakes to keep them from falling over. "Someone probably had the impetus to do it, but I think it's like community property now. We all sort of take care of them," Link said. "It's sort of, like, become the community garden." Nobody knows who the rogue gardener who planted the tomatoes is — but Link said it doesn't matter. "It actually hasn't come up," he said. "I think we're all just happy that they're there in a strange way." One of the neighbours, who didn't want to be named, posted pictures of the plants on Reddit. "I would definitely not eat any of those tomatoes if I were you," one user cautioned. "There's a nice sink hole at Dupont and Ossington that has been there for a week now, could hold a big plant," commented another. Toronto Water said it's aware of the sinkhole and has inspected it to determine if there is a leak. "Staff will return to the site to investigate," city spokesperson Diala Homaidan told As It Happens in an email. "We remind our residents to stay away from damaged infrastructure." But Link said there's really no rush. In what may be a first, he's asking city officials not to hurry to fix the massive hole on his street. "I'm hopeful, too, that getting attention doesn't get this fixed too soon," he said. "Because I think we're still a couple weeks away from harvest time." Written by Sheena Goodyear. Produced by Zara Syed.